When I was three years old my parents put me in creative movement class and that Spring I made my performance debut as a jellyfish in “Under the Sea”; that’s all it took to begin a lifelong journey in dance. Other interests and activities came and went, but dance has always been a constant. Even as I struggled to find how it all fit together, there has never been a time when I considered building my life around anything other than dance. I grew up in Columbia, Maryland where I danced at the modern-based Kinetics Dance Theater and went to public school in a county that employs dance teachers in every high school. I definitely didn’t understand at the time how lucky I was to have the opportunity to dance in school, and I didn’t value my modern training like I should have until I got to college—in fact, sometimes I wished I went to a more competitive studio like the other girls in my high-school’s company who could turn more times and kick their legs much higher than I could. It really motivated me and I pushed myself and my technique a lot during those high school years. Once I saw how my hard work was paying off, I began to think that dance might be something I could really build a future around. I’m so lucky to come from a very close and supportive family who never questioned me or suggested otherwise when I said I wanted to major in dance in college. At James Madison University I gained an extremely well-rounded view of the field and I was given the opportunity to stick my feet in every facet of dance and art making. Mentored by the program’s incredibly supportive and engaged faculty I choreographed, performed, directed, produced, designed, researched, taught and explored as many aspects of dance as I could. The dance department was my family at JMU and I have so many incredible memories and experiences from my time there. Faced with graduation in the Spring of 2009, I had no idea what to do next. The options seemed too broad and all the expenses of leaving school and venturing out on my own seemed too real. 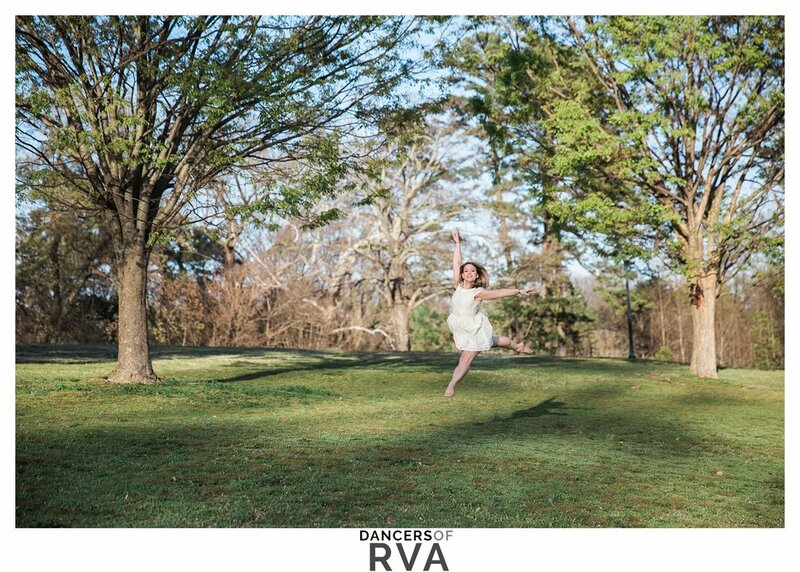 I auditioned for two MFA graduate dance programs but I couldn’t answer the question inevitably asked in the interviews: “why do you want to come to graduate school now?” Finding myself in Richmond with rent and bills to pay, I tried to fit myself in to a day-job box and defined my own dancing as something to be done on evening and weekend time. 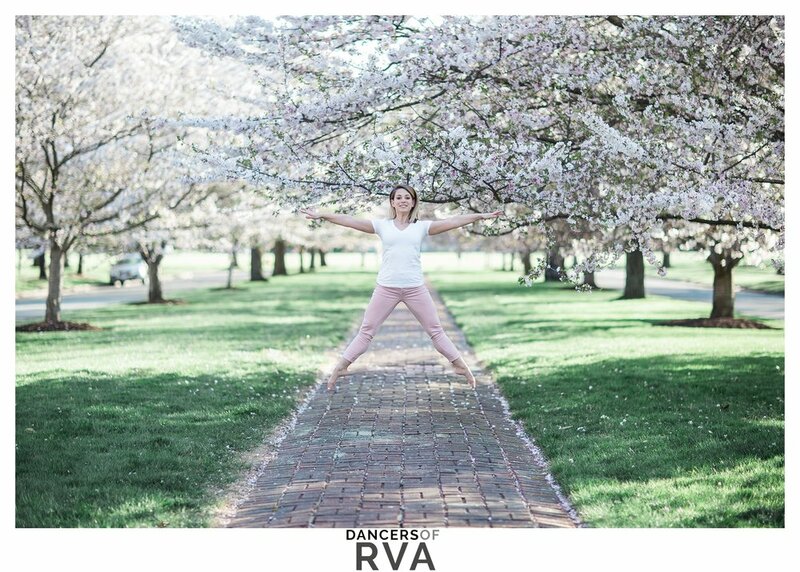 I worked for Richmond Ballet where I gained invaluable contacts and experience in arts administration, marketing and graphic design and was convinced--at least for a while--that I’d found a ‘real-world’ application for my love of dance. Of course the truth was that no matter how much I liked where I worked, the job wasn’t feeding my soul. One of the happiest days of my life was when I allowed myself to believe that I deserved to live my passion all day, every day. In 2012 I went back to school to pursue a Master’s degree in Dance Education from the University of North Carolina Greensboro. I worked through school student teaching at Henrico High School’s Center for the Arts, coaching the Midlothian and Lee-Davis High School dance teams, teaching upwards of 15 classes per week at a dance studio and performing and choreographing for the newly formed Dogwood Dance Project. I immersed myself in the Richmond dance community and guest taught, subbed and took classes from as many people as possible. During this time Dogwood also auditioned and accepted our first Dogwood Youth Ensemble (a free, pre-professional branch of our company which gives high school dancers access to rehearsal and performance opportunities outside of the traditional studio setting). The hustle was real, but I was happier than I’d ever been. I remember coming home from the studio at 9:30pm excited and inspired to start my choreography and lesson planning for the next day—that’s when I knew I’d figured it all out. When I saw that the dance job in Chesterfield County had been posted I knew it was my shot to do what I really wanted to do here in Richmond. In the Specialty Center for the Arts at Thomas Dale High School I teach curriculum-based dance courses which meet Virginia State Standards of technique, composition, improvisation, dance history, anatomy, dance production and dance literacy. I also direct the Specialty Center Dance Company, teach the dance department’s only open elective, and coordinate all productions, guest artists, masterclasses and trips. I choreograph the school’s musicals, co-coach the dance team, and advise our school’s chapter of the National Honor Society for Dance Arts. Even though the scope of my job was (and continues to be) daunting, I am in love with each minute of it and I remind myself every day of how incredibly lucky I am to offer this range of opportunities for young dancers in a state which doesn’t prioritize dance in education. In 2016 I worked with my incredible friends Tracey Clevenger and Sarah Wicker to open 804 Dance Place, our very own dance studio in Ashland, VA. All three of us were in very different places in our lives and dance journeys, but we had a shared vision of what we thought the perfect studio could look and feel like, and together—with all our different strengths, talents and abilities—we knew we could make that vision a reality and create a community where we really wanted to work, teach, and create. As we approach the end of our second full dance season I’m so excited for the growth we’ve already achieved and for all the growing we still have ahead of us! When I went back for my graduate degree I thought that teaching in a high school, owning a studio, and dancing with a company of my friends was everything I wanted to achieve, but now that I’m there I realizing there’s always going to be more I want to do. I want to be a stronger advocate for dance education here in Virginia. Learning through dance helps create better team members, more creative and critical thinkers, more self-motivated young women and men, and I watch my students—my auditioned Specialty Center students, my general population public school students, and my Dogwood and 804 Dance Place dancers alike—succeed in all areas of their lives because of their participation in dance and the skills and behaviors it demands. More students need the option of learning in this way, and not just in high school but in elementary and middle schools as well! I also want to do more work in bringing equitable access to dance programming and dance opportunities both in and out of schools. There are so many more stories to be told, voices to be heard, and work to be done when we challenge our own definition of ‘dancer’ to include anyone with a moving body and something to say or feel. I think the whole field needs to widen its lens and endeavor to be a bit more inclusive in order to truly allow dance and the arts to be transformative forces in our communities. My dance journey has been full, but it’s far from over and it hasn’t lost any of its magic because I still find it constantly growing and evolving. I’ve turned my favorite thing to do in to my purpose, and I find gratitude and motivation in that every single day. I lived right in the heart of Carytown for my first 4 years as a Richmonder, and my now-husband had to lure me across the Nickle Bridge with promises of Crossroads’ Thai coffee for me to even consider driving by a house he wanted to look at renting in Forest Hill. Despite the lower rent payments, beautiful trees and bigger backyards, I was convinced moving across the river would make us the most lame. The 5 minute drive back in to Carytown felt too far for the first month or so, but fast forward 5 years and I am in love with our neighborhood! I love our neighbors, all the dogs and trees and flowers, the South of the James Farmer’s Market, O’Tooles and Laura Lee’s, summer Sunday Music in the Park and our amazing sledding hill. I especially love Forest Hill Park and our afternoons spent wandering the trails with our dog. We took our engagement photos here and it’s so much fun to show my Richmond dance journey here, too! During the Summer of 2009 I briefly lived in Beckley, West Virginia and performed as a dancer with the company at Theater West Virginia. It was a 2-month contract with 7 other dancers from all across the country including Jason, who was there all the way from Baton Rouge, Louisiana! In mid-July I was offered a season internship at Richmond Ballet starting in September and all of a sudden I needed to make the 6 hour drive to Richmond on my one day off that week to find a place to live. I knew nothing about the city and it became clear very quickly that I was not going to be able to afford to live on my own, so I went back to Beckley with two rental applications wondering how I was going to make it work. Off-handedly I joked to Jason (who I’d known less than two months at this point), “want to move to Richmond?” and to my surprise he said, “…okay!”. The rest is history. For weeks the only three places we could drive to without GPS were the Richmond Ballet, the Panera with the free wifi, and Nacho Mama’s which is right around the corner from our first apartment in Carytown and where we’d drink margaritas religiously every Thursday night. Jason is such a huge part of my story; together we navigated life as new Richmonders, broke in to the dance scene (first as performers and then as choreographers and directors), made a group of friends, and married our partners. We taught side-by-side at the same studio for 5 years before both relocating to 804 Dance Place. I’ve brought him in to work at Thomas Dale, he’s brought me in to work at the Virginia Repertory Theater (where he is the Education Manager), and we’ve continued creating dance work and opportunities for Dogwood together over the past 7 years. Our lives are so intertwined it’s crazy to think how differently things might have turned out if we hadn’t made the leap to Richmond together. Collaboration and partnership is such a hugely important part of art and art making, and in a world which can sometimes feel cutthroat and competitive, it’s incredible to always have a friend at your side.